On my day off on Monday I had intended to cook the piece of pork loin I’d bought from our stallholder, Pleased to Meat You, outside on the BBQ. As you know the weather was horrible so I ended up cooking the pork very slowly in the oven. This isn’t an elegant looking dish but tastes delicious. Score the skin of the pork in a criss-cross pattern cutting through the fat but not into the flesh. Make a paste with the garlic, fennel seeds and salt in a mortar and pestle and food processor. Rub this over the pork skin pushing it into the cuts. 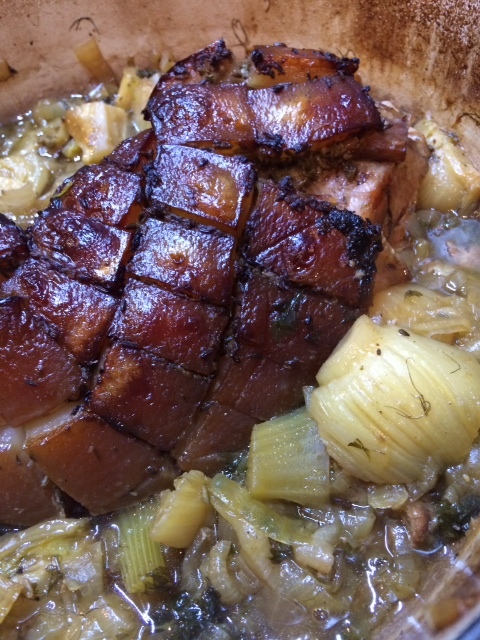 Put the pork into a flame proof lidded oven dish and surround with the onions, fennel and herbs. Pour in the wine. Place in the hot oven and cook for 30 minutes without the lid on. Next cover the dish and turn the heat down to 130°C. Cook for about 6-7 hours. After an hour or so turn the pork onto one side, then an hour or so later onto the other side. Turn it skin side up again. As it slowly cooks it will soften and gradually sink further into the liquid. Before you finally remove it from the oven take off the lid again and place the dish under a hot grill to brown up the skin. Some parts of it should go crispy. Take the dish out of the oven. Gently lift out the pork (it’ll be falling apart) and the vegetables. Cover them and set aside. Skim off and discard any fat from the top of the remaining juices. Place the dish on the stove top, add the cider vinegar and reduce the juices a little. Put the fennel and onions back in to heat through. Break the pork apart and serve with the fennel, onion and juices.